CREATING an effective brand is such a lengthy process that only people who love the craft survive the overwhelming odds. Lilu Aliño grew to be one of the most recognized creatives in Cebu’s advertising and public relations industry, with over 30 years of experience. A mass communication graduate of St. Theresa’s College, she worked her way up from being an officer-in-charge of Approach Advertising Inc. of the Norkis Group in 1984 into becoming a managing director of Lilu Advertising and Marketing Solutions Inc., a marketing communication consulting company she formed in 2009. But while working in the corporate world, the hardworking woman entrepreneur also joined her alma mater, teaching mass communication and business management programs since 1983. She said she loves to give back the skills and the knowledge she learned over the years to the school that once honed her to become what she is today. For Aliño, a career in advertising is one fun job because not only is one challenged to extract his creative juices, people working in this field get to deal directly with decision-makers. “I’ve had amazing bosses over the course of my career who have encouraged me to make big and bolder decisions,” said Aliño. After working at Approach Advertising Inc., Aliño took a leap of faith and set up her own advertising firm, Creatron Ads Inc. The company handled the marketing and advertising needs of Cebu Holdings Inc. for Cebu Business Park. She also handled the campaigns of Rustan’s, Sulpicio Lines and SM City Cebu back then. Wanting to make her company digitally ready, Aliño sold Creatron Ads to Bigfoot in 2003. She then became the head of creatives and production at Bigfoot Global Solutions Inc. until 2008. “It was the start of the digital transformation era, and I wanted to integrate that into our system so I decided to sell the company to Bigfoot,” said Aliño, adding that it was a right decision she made, knowing the potential and immense opportunities that the acquisition could bring. The team learned graphic design, animation, video production and other sophisticated strategies necessary to stay ahead in the advertising ballgame. “I wanted to be exposed to technology,” she said. But in 2009, the urge to run her own company compelled Aliño to resign from Bigfoot. She set up Lilu Advertising and Marketing Solutions Inc. She said she wanted to regain the freedom of working at her own pace and terms, and owning her own time, which she lost working back in the corporate world. “I wanted to experience again the freedom to decide on my own. I wanted my ideas to come into fruition and also because my clients were still there, urging me to come back,” she said. Aliño’s stint in the advertising arena led her to build contacts in business. It also exposed her to communities and organizations she now voluntarily serves. She is an active member of the Cebu Chamber of Commerce and Industry (CCCI), serving as chairperson for publicity and promotions of the Cebu Business Month for seven years. 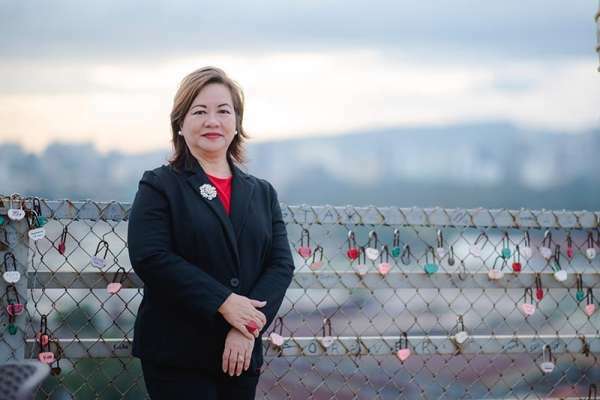 She also handled the promotions of notable events like the 27th Confederation of Asia-Pacific Chambers of Commerce and Industry Conference, and now the overall chairperson of the Cebu Business Month 2019, the month-long business activity of CCCI. Her passion to serve also brought her to the Rotary Club. Aliño held various positions in the organization. One of these is the public image chairperson of Rotary International 3860 and she is now the incoming district Rotary foundation chairperson. “If you look at it, it’s tiresome, putting on different hats. But just recently, I learned that my name Lu means ‘generous,’ so I guess I’m just happy sharing my time and service, not only to my family but to the different organizations and communities I belong. And I’m happier,” she said. I worked for eight months as an account executive selling memberships for Book Dale Club. After that, I joined the Norkis Group as a junior account executive for the company’s in-house advertising agency, Approach Advertising. I had a good experience then because I was exposed to the top management, working alongside the decision-makers. I was assigned in Manila. I rose from the ranks and became officer-in-charge for three years. The job was a bit challenging because the group had about 50 branches, but the job was a test of what I learned in school. Norberto Quisumbing Jr. played an important role in my decision to become an entrepreneur. I learned a lot from him. He’s one of my mentors who I looked up to—a man loaded with ideas, so credible, and a visionary. At 21 years old, I couldn’t believe that there was this man who believed in my talents, in my capacity to overcome obstacles. His affirmation and that reassuring gentle pat on the back empowered me to do things greater, even on my own. Advertising is so powerful that it can make people act together. It’s so influential that it can make an unknown brand become top-of-the-mind. The industry brings out the creativity and enhances your social skills. It brings so much happiness if I am able to help organizations and companies achieve their goals with the services I render to them. Advertising is a big industry that has stood the test of time. Although the means of communication has changed now, companies and organizations need the industry to help get their message across or inspire people to act. It brings fulfillment to see a small company leapfrog into a medium or large size business, all because you helped them communicate their vision. Moreover, this industry unleashes your creative spirit. It allows you to think out of the box, think bigger and even take risks. My exposure with the top management of different companies and experts in the industry honed my skills. My over 30 years of experience taught me a lot. I share something new to my students every now and then. Failure, for me, is part of success. We all learn from our mistakes. Sure, life never runs out of challenges for you to face, but it’s the proper mindset that will help you get through every setback. I also found comfort knowing that my husband, Dongie, is my number one supporter and mentor. He never ceases to remind me not to overthink on problems. He tells me to sleep on it so I could get a better perspective and a wiser decision when I wake up.